Star Wars New Hope @ 40 Two years ago, the helmet of an Empire Strikes Back stormtrooper fetched $120,000 (£92,736) at US auction. An Imperial TIE fighter pilot's helmet, said to be one of just 12 made for A New Hope, went the following year for £180,000 ($233,244) – something the BBC's Antiques Roadshow presenter Fiona Bruce dismissed as a "piece of plastic". Big money indeed, but the record to date for stormtroopers, the most widely recognised symbol of the Empire, is held by A New Hope sandtrooper helmet, named the Stop That Ship Helmet for the scene it briefly appeared in – the Millennium Falcon blasting out of Mos Eisley under fire. That helmet sold at auction in April for $190,000 (£145,675) in the US. Yes, four decades after A New Hope debuted in the US – 25 May, 1977 – props built for just £20 a pop are fetching the price of a three-bed semi in the West Midlands. What's helping drive up the price is scarcity: just 50 stormtrooper uniforms were made for A New Hope. Those that survived the shoot now reside in private collections. 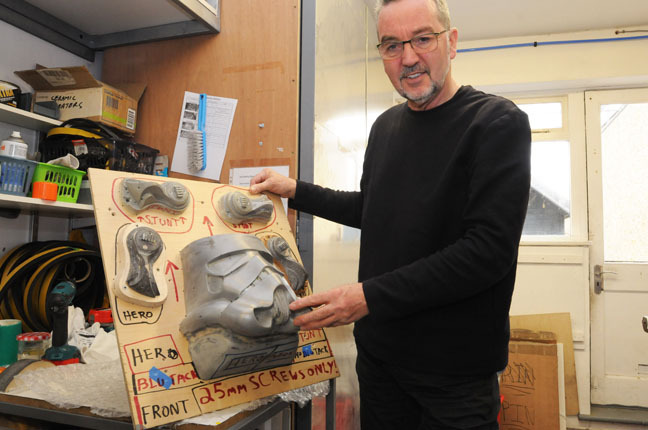 "There are very few originals from the films – they are props and they are never strong enough to last 10 minutes and the studio holds them for another film," says Andrew Ainsworth, maker of those 50 trooper uniforms plus a further 150 other instantly recognisable Imperial and Rebel uniforms that defined the Star Wars look as we know it. "People will save up and save up. Rather than buy a piece of furniture, this means more," Ainsworth said. "Once they get that known collectability and value, they become more interesting than antiques – you might get a fabulous Georgian hunting table for £40. It's just what people relate to." Of all Ainsworth's pieces, it's the New Hope stormtrooper that's in demand, mostly by men, mostly aged between 30 and 40. "Everybody loves the New Hope stormtroopers," confirms Mark Edwards of Cast from Original (CfO) who specialises in Return Of The Jedi stormtrooper armour. "Everybody thinks the Jedi stormtroopers are the ugly cousins." "Sharper," Edwards tells me at his purpose-built studio in his Teddington back garden. More hand-painted details, greater symmetry, a smaller head and foam had been added inside the helmet by the time of Empire. Then you have the hero versus the stunt helmet. Stunt helmet? Look very carefully at the stormtroopers' eyes next time you watch A New Hope: the hero helmets' eyepieces are bubble shaped. Ainsworth intended them to convey a sense of future soldier equipped with all-round computer-based vision. Utterly impractical in real life, as actors couldn't see straight when wearing them. Flat pieces of green-coloured plastic had to be introduced. That is the stunt helmet. "I think a lot of the older men are buying it because they've always wanted to look like a character from Star Wars but have never been able to afford the originals," says Edwards. "There is that thinking if you dress up as a stormtrooper and look at yourself in the mirror, then you are transported into the world of Star Wars." No, they tap a cottage industry of British specialists – Ainsworth's Shepperton Design Studios, Edwards' CfO, and RS Prop Masters in the UK. This trio is busy vacuum forming sheets of white ABS plastic using curved moulds to a 1.5mm thickness, cutting out and assembling around 30 pieces per suit, making straps, body suits, eyepieces, mics, boots and blasters. Prices run from £1,200 – around $1,550. And in case you were wondering, there are few concessions on size or girth. The original stormtrooper was 5ft 10in and 110lbs. He remains so. The most you can expect is a little extra plastic around the overlapping at the edges if you're a little large for a stormtrooper. What makes these suits particularly sought after, though, is their heritage: a bloodline connection back to the original 50 New Hope troopers. That's important to members of the 501st, the world's largest Star Wars costume club and biggest single-buyers market. However, you also get individuals buying these full sets of armour to wear or display and there's still growth in overseas markets not as Star Wars saturated as the US or UK. "We get people from all over the world to be measured up and have us build suits," Rob McCormick, co-founder of Stockport-based RS Prop Masters, tells me on the phone. "I'm expecting a guy coming in from France and had a guy from Australia." When it comes to the family tree, Ainsworth plays a strong hand having been responsible for the helmet and body armour, pressing them in ABS back in 1976. Buy an Ainsworth, and you're getting a suit cast from the original moulds. A full Ainsworth, from white Chelsea boot to helmet via blaster and serial number, will set you back just shy of £1,800. Ainsworth claims to sell "thousands" of various uniforms a year with finished products shipping in an Apple-style presentation box. Ainsworth employs six in Twickenham and Wales working on build and dispatch. Ainsworth adds an acrylic finish to his ABS, which comes from Metzeler in Germany. No British suppliers are good enough, he claims. The acrylic stops the snow-white armour yellowing.